The histroy says that saint came to ullal around 500 year ago from the holy city of madina in Saudi arebia by floating across the sea on piece of chader or musalla. He camped at a small masjid in melangadi area, which is the present juma masjid for ullal,permannur, someshwar kotekar and jeppinamogeru villages. The Saint led a very pious and simple life. His simplicity and devotion of faith, love towords the poor attracted villagers. The villagers were poring towards in because he used to solve their problems through his prayers and spiritual powers. Hearing of his miraculous healing people irrespective of caste and creed flocked to ullal have a glimpse and blessing of the saint. Later on the saint married a girl from a poor and respectable family. He suddenly started throughing water upwards toward western side. He was found throughing the water high above him. People who were the Wuzu near him were surprised. Later they asked the saint why he did so? The saint replied that he was trying to extinguish the fire that was broken out at makka masjid (Haram Shareef). It was later confirmed by the pilgrims who had been to makka that there had indeed been a fire in a corner of the Masjid at Makka and a sudden showers had extinguished it. she would cope after his death? The saint consoled her and told her that she would find a rupee coin beneath her pillow every day. That is exactly happened after the death of the saint. As like any other women the widow instead of spending the entire money saved half of a rupee. To her surprise, the next day on words she started finding only half a rupee her pillow. Realizing her folly, she began spending the whole amount without saving anything till her death. 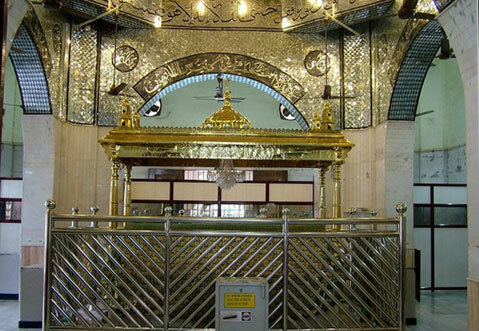 When the saint died a tomb was erected over his gave which is the present day darga. Even today miracle continued to take place there dumb person who used to visit the darga regularly fell down without any reason. As and when the person regained his conscience, to his surprise he had his speech fully restored. A month long uroos celebration held once in 5 years attracts huge crowds. Once during the period of uroos a person commited theft. After a while he suffered severe stomach pain. Immediately doctors were summoned but in vaim. Finally the man admitted his fault and sought the pardon at the darga of the saint. After that he was re leaved of his pain. On another occasion of the uroos, catholic painter by name albert who was doing the painting work at the darga made a vow for the return of two gold necklaces that he has lost 2 years earlier, if he receives back he would offer certain offering at darga shareef. The next day he found the same ornaments wearing by women at Mangalore. Thus he was able to recover them. True to his word full filled his vow also. In the year of 1945 there was a cute shortage water in the melangadi area, were the present juma masjid situated. It was time of uroos festival thousands of devotees had come to the uroos festival. There was no water to drink and cooking purposes at darga. The devotees assembled at darga for the uroos prayed for water and saved them thirst. To their surprise a gurgling sound was heard and water filled up in the well near darga. Ever since then this particular well never dries up, even if the surrounding areas face dry spells. Devotees visitng darga drink this water believing that it has curative powers. Even now whatever quantity of water is drawn from this well the water does not get exhausted, on other occasions the water could be completely drained within an hours time by pump. Devoting visiting darga drink the water of this well with devotion and faith. The first annual uroos celebration was recorded in the year 1920. Later on the managing committee was celebrating celebration once in 5 years. These celebration last for a period of one month. During the uroos period renowed scholars give religious discourses in arebic, urdu, Malayalam and kannada. Devotees from all part of India irrespective of cast and creed visit the darga and pay their homage to the saint and seek his blessing and to fulfill vows. The last uroos held during the month of the april 2010 attracted more than 15 lacks of devotees. Uroos ends with mass feeding. A team of jamath volunteers manages the mass crowd as no police personel are permitted within the darga complex. The original tomb of the saint was enlarged and renovated in the 1970. The govt. of Karnataka was kind enough in sanctioning grants for roads and street light and for other civic amenities.